Curacao is an island in the southern Caribbean Sea, off the Venezuelan coast. 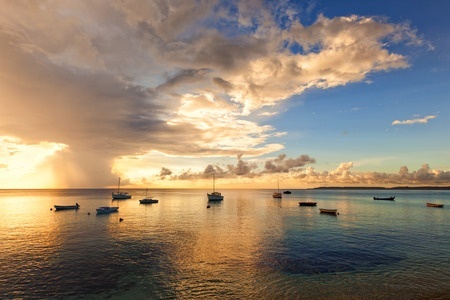 The Country of Curacao, which includes the main island plus the small, uninhabited island of Klein Curacao, is a constituent country of the Kingdom of the Netherlands. Its capital is Willemstad. Hundreds of artificial coral blocks that have been placed are now home to a large array of tropical fish. Fishing is a staple of diets of locals, so fish are prevalent and available as work and sport. The island has a semiarid climate with a dry season from January to September and a wet season from October to December. The temperatures are relatively constant with small differences throughout the year. The trade winds bring cooling during the day and the same trade winds bring warming during the night. The coldest month is January with an average temperature of 79.7 °F and the warmest month is September with an average temperature of 84.0 °F. The year’s average maximum temperature is 88.2 °F.” So, as you can see the weather for Curacao Fishing is excellent. Whether you decide to go inland or going to sea, Curacao Fishing Guides or Curacao Fishing Charters ensure that your angling adventure is at the minimum an enjoyable and remarkable one, and provides you the greatest opportunity to bring home a fish.